1. 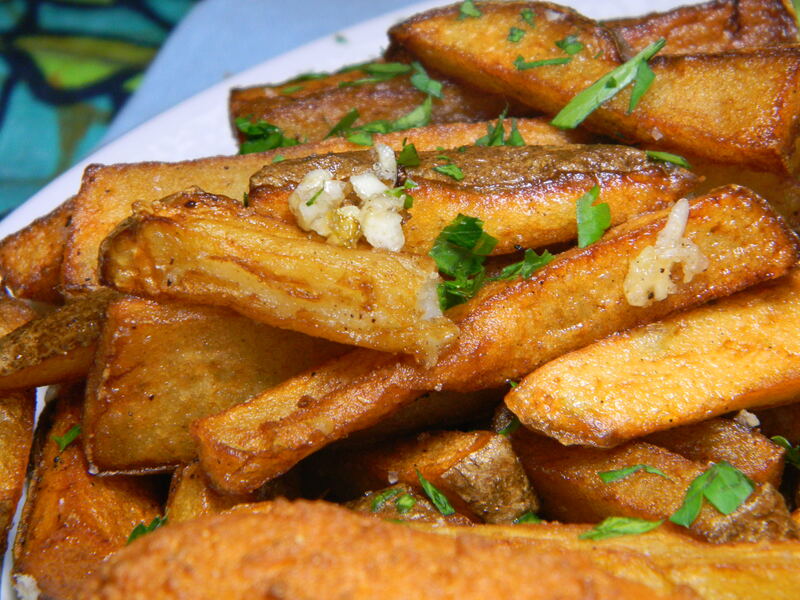 Slice the potatoes (skin on) into 3/8-inch-thick fries. Rinse, drain, and pat dry. 2. Mix the garlic with the olive oil and set aside. 3. In a deep-fryer or heavy pot, heat the vegetable oil to 375°F. Deep-fry the potatoes (in batches, if necessary) for 5 minutes. Drain on paper towels. At this point, they can rest for up to 2 hours at room temperature. 4. Reheat the oil to the same temperature (375°F), and refry the potatoes for 2 to 3 minutes, until crisp and golden. Toss them in a large bowl with the garlic-oil mixture, chopped parsley, and generous amounts of salt and pepper.